This Chapter discusses how end users have the option not to accept plain vanilla fixed price retail contracts and instead have full or partial exposure to the wholesale market pool price and manage their risk through demand response and other hedging mechanisms. End users can gain the full benefit of demand response rather than giving half of the benefit away to retailers and demand response aggregators. Retailers bundle up electricity products into a vanilla product, and many businesses are unaware that there are other options besides this product. This chapter looks at an alternative to buying electricity at risk-premium-laden fixed prices, and shows how significant savings can be made by buying electricity at wholesale market prices. It will also highlight the risks of this approach, and the methods of managing that risk. However, retailers provide another service that most businesses don’t even realise they are getting, and it’s an expensive service. Retailers provide a risk management service bundled in with the supply of the electricity, often at high risk premiums. To some extent the retailer is smoothing out the risks by aggregating all of the different customers into one or more portfolios, thus reducing the large number of individual risks into one or more portfolio risks. The profit risk to the retailer can then be stress tested against different scenarios, such as large movements in average market prices and changes in the overall economy that affect demand and credit defaults. The impact of the assumptions made in an individual supply contract can also be tested against the overall portfolio. So the poor old retailer is bearing the brunt of everybody else’s risks. As the retailer is having to wear those risks, it charges a premium to do so, and that premium reflects worst-case scenarios. Instead of the retailer being burdened by the weight of their customers’ risks, it is now feeling the weight of potential sacks of gold over its shoulders. If the worst-case scenarios do not manifest then they get to pocket the worst-case scenario premiums that they have charged their customers. Many businesses don’t even realise that there are other options for purchasing electricity. Negotiating a good price on a standard retail contract might seem like a good approach, but if you understand the intricacies of the electricity market and the power requirements of your business, you can bring huge financial benefits to your business if you get a bit more creative with your electricity purchasing. The second DSM method is load shifting. By understanding likely price patterns, such as early morning and late afternoon price increases, businesses can often shift their load – to some extent – to maximise the exposure to the very low prices and minimise their exposure to the higher prices. Great examples of this are irrigators and water utilities that can schedule pumping at times when prices are historically low, while not running when prices are historically higher. Couple that method with load curtailment to avoid the price spikes and these businesses can achieve average prices well below the fixed retail price offers. The first is to contract with a retailer to supply you on the basis of pool pass-through prices. With this type of supply arrangement the retailer will charge a management fee to cover their own costs and to make a margin. A large user may opt not to pay the retailer any management fee and become a market participant themselves. This is something we did in one of the businesses that I worked for. We had already established ourselves as market participants in the gas short-term trading market, and the leap to doing something very similar for electricity was not very large. However, inevitably there is still a substantial cost in managing the obligations that a market participant has, whether you outsource this function or employ someone and bring it in house. If the cost of becoming a market participant is not too different to the retailer management fee then I would suggest going with the retailer product instead. If you contract with a retailer to provide you with a pool price pass-through product then your monthly billing will be very similar to the standard billing you would get with a vanilla contract. The only difference is that instead of peak and off-peak energy usage charges you will be given an energy pool price pass-through charge. It’s important that you have your own internal check of what those charges should be, so that you do not simply accept the retailer charges. The retailer charges should not be a surprise as you should be monitoring and reporting every day on your electricity usage and costs, and the end-of-month bill should be confirmed with your own data. Our previous analysis has shown that if you adopt a pool price pass-though strategy your average price for the full year is likely to be at or below the best fixed retail price. Historically, in South Australia it is likely to be significantly below, and depending on your load profile it may well be lower in Queensland. In Victoria and NSW the average price is likely to be near the fixed retail price. The other non-constrained assets are those that are not required to run all of the time. This equipment is often shut down because the buffer stock after its process fills up or its scheduled operating time is less than the constrained asset run time. 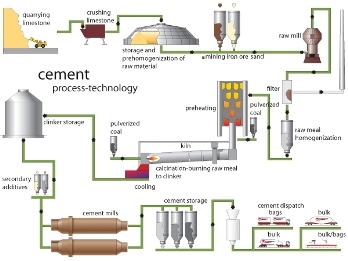 Let’s take a look at the example of a cement plant. The following diagram shows the key unit processes. The heart of an integrated cement plant is the clinker rotary kiln. The kiln has internal flame temperatures in the order of 1,500˚C and so is refractory lined. Turning the kiln off and on for short periods has a negative impact on the refractory lining and shortens its service life. It is also the constrained asset. It is usually required to run 24 hours per day, seven days per week for more than 340 days a year. The kiln is usually only purposely turned off once a year for two to three weeks for an annual shutdown to replace refractory material and repair or replace other wear items. A curtailment strategy would usually only require the kiln to come off under extreme circumstances. The processes prior to the kiln involve the mining, crushing and processing of materials. Quite often it’s possible to turn off the crusher and raw mill for short periods without having any impact on the kiln. The cement mill or mills are usually designed with greater capacity than the kiln and greater capacity than the cement product demand. It is therefore very easy to instantaneously turn cement mills off without impacting customer supply, provided cement silo stocks are adequate. There is also a large amount of ancillary equipment that can be closed down with no impact on customer supply. It’s therefore possible much of the time to reduce the electricity demand of a cement mill by 50% for short to medium periods without impacting customer supply or profitability. In some cases, cement not made locally due to high price events can be replaced by cement made at other facilities, or even imported cement. I’ve had many clients who initially say there’s no way they could contemplate shutting down equipment even for half an hour as it would impact upon costumer supply or service. However, when I have analysed those same plants I have found that they consistently shut down every day for morning and afternoon tea, lunch, meetings, breakdowns, and for full stock. They were often surprised at how often they actually shut down. Next, let’s examine the impact of demand side management for a hypothetical plant in South Australia, using actual 2016 prices over the whole year. In order to produce its target production, the plant aims to consume 8,784 MWh of electricity. However, it has total flexibility in when the plant is run, and can increase and decrease the number of production lines to meet product demand. We can see the large difference in electricity costs with different load profiles. Load Profile 3 (8:00 am to midnight, Monday to Friday) was the most expensive and would have cost $921,000. This would have cost $104.85/MWh or 10.5¢/kWh. Shifting the load to off-peak periods (Profile 6) would have resulted in an almost $400,000 saving, despite the same electricity consumption. This would have cost $60.36/MWh or 6.0¢/kWh. Let’s examine the impact of load curtailment at prices exceeding $1,000/MWh. For simplicity, we will assume that the curtailed load was not made up, and that the full value of the curtailment was achieved (load was curtailed to zero for the full half hour). This would not be the case in reality, but the example serves to show the full “size of the prize”. The savings achieved with load curtailment ranged from $70,000 for Load Profile 6 to $21 ,000 for Load Profile 3. The savings were, on average, 20% below the non-curtailed load profiles. Obviously you must consider the impact of curtailment on production. Load Profile 1 would have lost 96 half-hour periods over the year, equivalent to two full days of lost production. Load Profile 6 would have lost 13 hours over the full year. In reality you would likely set up a curtailment schedule that curtailed some of the load and not all of it, and on some occasions customer demands would prevent you from curtailing and on other occasions the price spike might be missed altogether. This example serves to illustrate the magnitude of the savings possible through the DSM techniques of load shifting and load curtailment. It also serves to show that even though very high prices might occur, over the full year these are averaged down by the majority of low prices. In fact, during this 2016 period the maximum half-hour price was $13,766/MWh. Going a different way does have risk, but risk does not mean risky. Risk is simply uncertainty. With a pool price strategy the average annual price is not certain and so there is a risk. A retail price is fixed and so there is no price risk. However, there is a very high risk that the fixed retail price will be higher than the average wholesale market price over a full year. So yes, a spot exposure strategy is more “risky” than a vanilla fixed retail contract, and with taking on that “risk” there is an expectation of a return. History has shown that the worst possible outcome from a pool price exposure strategy has been close to the best retail offer prices, depending on the timing of the retail offer. In the wholesale electricity market the risk is the distribution of average prices. This risk can be quantified through looking at historical results and by forecasting into the future. The very clever propeller heads in the generation and retail segment do this all the time. The fixed-price retail offers reflect the best known information and projections at the time of the offer. The trick for businesses is to understand historical price volatility and annual average prices, overlay your informed view of what is happening in the market structure on the coming years, and then compare that with fixed price offers. If your informed view of likely market price distribution outcomes is at or above a fixed price offer then by all means lock in the fixed price offer. If your informed view is that market prices are likely to average below the best fixed price offer then why would you want to lock in high prices? Let’s have a look at each of these. As we’ve looked at throughout the book, retail contracts can vary in terms but they essentially fix electricity prices on a flat or peak and off-peak basis for variable volumes. Such retail contracts eliminate price risk for the end user as the end user is paying the retailer a risk premium for the retailer taking on spot risk and volume risk. As we’ve seen, the price paid for electricity retail contracts consists of a number of components – these include the price paid for the energy (kWhs) inclusive of the retailer costs and margin, and the insurance policy (risk premium) that protects customers from the volatility of electricity prices. Most consumers do not recognise the magnitude of this insurance premium, or even that they are actually paying the retailer an insurance premium. In individual years a wholesale market price exposure may do as poorly as a fixed retail contract, or worse, but over the course of 10 years you will almost certainly be well ahead of fixed retail prices. This has been my own experience over 16 years since 2001. The drought year of 2007–08 was unexpected and wholesale market price exposure performed worse than fixed-price contracts. And, depending on the timing of going to the market, 2016–17 has performed worse than fixed retail offers due to the bringing forward of the closures of the Northern Power Station and Hazelwood Power Station. Customers choose exposure to wholesale (spot) pricing when they realise they will achieve lower electricity costs in the long run by accepting the risks of volatility themselves, and can also provide themselves with their own physical (load curtailment) insurance and financial (hedge) insurance. To achieve lower pricing in the long run, the procurement of electricity is no longer a simple procurement process involving competitive tenders but one more complex, requiring an integrated approach between procurement, operations and risk management. I have found that there are often opportunities to curtail a significant portion of total load without impacting on business objectives such as total production or maintaining customer supply or service. Hedging contracts are a means by which participants can negotiate or lock in pricing certainty over time over a fixed volume of electricity. Hedge contracts can be traded on a financial market such as the ASX Energy futures exchange or over the counter (OTC) with financial institutions. These contracts settle financially at the end of the contract period based on the difference between the contract value and the average price settled in the wholesale market. Exchange-traded futures and options are traded on the ASX Energy futures exchange. A futures contract is an agreement to buy or sell an underlying asset in the spot market at a predetermined time in the future for a fixed price that is agreed today. Essentially a block of electricity to be used in the future can be purchased or sold in the financial market today at an agreed price. This allows an end user, retailer or generator to lock in future prices today. The futures contract is a financial instrument, or derivative, based on an underlying physical commodity, in this case electricity. For example, if in December 2017, March 2018 base-load futures are trading at $100/MWh and a factory decides that they would like to lock in that price now, they could buy that futures contract. Let’s say that the factory has an average load of 1 MW. The 1 MW March 2018 futures contract is purchased for $100/MWh in December 2017. This contract has a value of $100 × 31 days × 24 hours × 1 MW = $74,400. However, the purchaser does not pay the full value but rather puts up an initial margin that is usually around 5% of the value (this can change with market volatility). In this case the purchaser needs to put up a margin of 5% × $74,400 = $3,720. As the futures price is settled each day, the margin account is credited or debited depending on which way the market has moved (in favour of the buyer or the seller of the contract) until the expiry of the contract period, in this case at the end of March. If the average spot market price for March 2018 settles at $110/MWh then the contract purchaser is paid $110 × 31 × 24 × 1 = $81,840, making a “profit” of $7,440 on the futures contract that they had purchased for $74,400. The factory paid an additional $10/MWh for their actual electricity consumed more than their $100/MWh target as the average price was $1 0/MWh. Therefore, this electricity cost them an additional $10 × 31 days × 24 hours × 1 MW = $7,440. The profit or gain on the futures contract offsets the additional cost of the actual electricity used above their locked-in price of $100/MWh. If the actual average spot market price settled at $90/MWh for the month, the factory would have paid $7,400 less for their actual electricity consumption versus their locked-in price of $100/MWh, but would have made a loss of $7,400 on their futures contract. The gain or loss on the futures contract offsets the additional or lesser cost of the physical, or actual, electricity consumed. Basis risk: the hedge is not a perfect hedge as the futures contract is settled on the time-weighted average price whereas the price paid for the physical is a load-weighted average price. If the actual load is higher during high price periods and lower in low price periods the load-weighted average price of the physical would be higher than the settled price of the futures contract. Default risk: this is the risk that the futures contracts will not be settled. This risk is very low with exchange-traded futures as a market clearing house novates the contracts and eliminates counterparty risk. ASX participant rules in regards to participant financial minimum requirements, initial margin requirements and daily mark-to-market requirements ensure that the contracts will be settled. Over-the-counter contracts have a higher default risk than exchange-traded contracts, however this is also usually very low. A quarterly base load $300 cap is a contract that is similar to the futures contract we just discussed, but the average price over the quarter is calculated such that the maximum price in any one half- hour interval over the quarter does not exceed $300/MWh. This allows the end user to capture the benefit of lower prices but limits the downside half-hour price to $300/MWh. Whenever I have analysed using futures and options to give price certainty I have found them to be very expensive; that is, it’s the same as the windscreen insurance analogy. It does provide certainty over some or all of your load though, if you want that certainty at the expense of possible savings. In reality, if that’s what you want you may well be better off locking in a short-term fixed retail contract. Over-the-counter (OTC) products are similar to the exchange-traded products except that they are a direct transaction with a market participant or intermediary for an electricity product that financially settles against the electricity market settled price. There is a higher counterparty default risk as the transactions are not novated by a market clearing house. The parties need to make their own assessment of the other party’s credit status and risk. Let’s have a look at the major over-the-counter products. Swaps are essentially a contract to swap the difference between a fixed and floating rate. With a straightforward vanilla swap, one party contracts with another to exchange a floating electricity price for a fixed price over a defined volume for a specific period in time. For example, an end user would enter into a contract with a swap provider to pay a fixed price for a fixed block of electricity over a set period of a specific quarter. The average spot price over that quarter will be the settlement price, and the end user would pay (spot price is lower than fixed) or receive (spot price is higher than fixed) the difference between the swap fixed rate and the settlement price. Settlement may also occur at predetermined intervals throughout the contract period. The hedge calculation is the same as that for an exchange- traded futures contract but the contract size can be set at an agreed, tailor-made volume. Sculpted swaps are contracts to swap the difference between fixed and spot rates for different predetermined load volumes over predetermined time intervals. For example, a sculpted swap contract could be established where the end user pays or receives the difference between the spot and fixed prices for 13.5 MW between 7:00 am and 9:30 am and between 3:30 pm and 7:00 pm, and receives or pays the difference between the spot and fixed rate over 24 MW for all other time periods for the contract duration. Such a contract offers a lower cost swap than a vanilla swap for 24 MW. Swaps are also known as contracts for difference (CFDs) or fixed-for-floating contracts. Caps are also known as one-way CFDs, and provide protection for a buyer above a predetermined price for a predetermined volume and period of time. The hedge calculation is the same as that for an exchange-traded options contract but the contract size can be set at an agreed, tailor-made volume. Floors are similar but opposite to caps in that they set a maximum floor price. Generators may use floors to guarantee a minimum price. Collars are a combination of a cap and a floor in which a minimum and maximum price can be set. Collars allow buyers to decrease the cost of a cap by selling a floor. Caps, floors and collars are usually settled at predetermined intervals throughout the contract. Asian options are OTC options in which the settlement price is based on the average level of price throughout a predetermined period. They are also known as “fixed strike Asians”. Asian options can be in the form of a call or a put, and are typically used as the basis for a cap (call) or floor (put). Basis risk: once again the hedge is not a perfect hedge as the swap contract is settled on the time-weighted average price whereas the price paid for the physical is a load-weighted average price. OTC swaps have an advantage over futures contracts as the swaps can be tailor made to better match the load profile. The basis risk can again be mitigated with a load- shed management strategy. Default risk: this risk is higher than with exchange-traded derivatives as the contract is not novated; that is, there is counter-party risk of default. This risk is managed by ensuring the counter party has a strong credit rating or by securing bank guarantees. financial intermediaries such as major banks. boards and senior management are wary of the use of derivatives after highly publicised cases involving the misuse of derivatives, such as Enron, Pasminco and NAB. In my experience the cost of the hedge product usually more than negates the potential upside of a wholesale market strategy. If you wanted to hedge 100% of your load to eliminate the risk or fluctuations in monthly costs then you are just as well off with a retail contract and then you don’t have to worry about the added complexities of financial risk management and hedge accounting. If you wish to hedge just part of your load – for example, the load that you can’t curtail – and leave the rest of your load exposed to the market then a hedge strategy may be appropriate. shops with backup supply for refrigeration. It’s very common to have backup generation in the event of main grid supply outages. Some businesses also have backup generation for high electricity spot market events. The backup generation effectively works as a cap: the diesel or gas generation can be set to turn on when the cost of this generation is below the spot market price. The variable cost of that generation is the cap price. There are obviously high costs in setting up backup generation, including high costs with grid synchronisation requirements. There are also complications with large backup generation (greater than 30 MW) that is synchronised with the grid as the owner of the generator would need to become a registered participant and comply with market rules and directions. Whenever I have researched setting up physical hedging with gas or diesel generation to manage the risk of high price spikes, I have found that the business case does not stack up as the price spikes above the break-even point for the generator are very infrequent. It can work, however, for businesses that already have the generation installed for purposes such as critical equipment backup supply, or they may have had the generators from another project that no longer requires them. The cheapest form of a physical hedge is demand side management (DSM). Demand side management was examined in detail earlier in this chapter: from the perspective of an end user, it can be described as the management of electricity consumption to increase use during low-cost periods and decrease use during high-cost periods, including short-term price spikes. The term is also used to encompass electricity efficiency measures in response to increasing prices; that is, reducing electricity consumption during both high- and low-cost periods. Load curtailment has the potential to provide significant financial benefits to demand-side participants and contribute to the overall efficiency of the energy market. By analysing electricity price patterns by time of day, day of week and month of year, businesses can schedule their activities to minimise their overall annual average price. For example, if a plant has an annual shutdown it could schedule that shutdown during the historically high-priced months. Plants that have weekly scheduled maintenance for individual assets could schedule them for a historically high price day, and time them to start just prior to the high-price morning period. For operations that run 24 hours a day, they could maximise the loads that are not required to run all the time during the historically low price periods – for example, overnight and weekends – and minimise their operations during the historically high price periods of early day time and late afternoon and early evening. Some retailers that are more flexible offer a hybrid contract whereby they provide a wholesale market pool price pass-through arrangement and then offer, effectively, the option of quarterly swaps for up to two years in advance for blocks of 1 MW or multiples of 1 MW. The customer can then choose what quarters they would like to hedge and for how much load. The customer can make an assessment of the value of the swap price compared with recent wholesale market pricing, pricing trends and their view of future prices. For example, a large customer could set a policy that they must hedge 50% of their load at least one quarter out from the commencement of a market period, but could then have flexibility to hedge up to, say, 80% of their load depending on the attractiveness, or otherwise, of the swap prices being offered. This type of strategy is usually only available to large consumers in excess of 10 MW demand size, or 50 GWhr per year. in the very early morning and the early evening, but generally the period of solar generation, provided the sun is shining, is during the higher priced day-time period. The customer has greater pool price exposure during the relatively low priced night-time period. I have reached agreement on a 15-year electricity supply contract that was the most competitive offer for year one of the contract and quickly became a contract that had pricing well below the retail market pricing. This agreement had no take-or-pay commitment (minimum volume requirements). Long-term contracts tend to favour the buyer, provided you are not outwitted by the annual price escalation clause. If you are interested in learning more about increasing your options to reduce electricity costs then contact me at michael@altusenergy.com.au or purchase the book here.